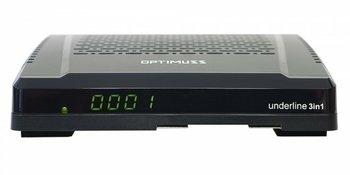 The OPTIMUSS UNDERLINE 3in1 belongs to the new EDISION series and it presents the new "mini-box" solution to OPTIMUSS HD receivers. It has one of the smallest enclosures in the market, yet is provides full technical features for you to enjoy at it's best. By having the ability to be hidden, using it's special base and external 12V power supply, on the back of the TV set, you have a receiver that is practically invisible! Moreover, it has an additional tuner interface for hybrid use of DVB-T2 / DVB-C tuner and also Display! Plus, with features like USB connection for recording & Media Player, Smart Card, Ethernet port and wireless connection by means of USB WiFi Dongle, this receiver will be among your first choices.